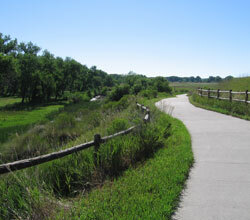 A large portion of the Poudre River Trail wanders through the Frank State Wildlife Area. This area has several ponds and is an excellent place for birdwatching. It is also an exceptionally pretty section of the trail. To get to the Frank State Wildlife Area trailhead from Highway 392, turn South on County Road 13 and drive 0.5 mile. The trailhead going East has parking for this section and informational signs. The trailhead going West is about 200 feet offset to the North along County Road 13. There is no restroom at this trailhead. At Frank State Wildlife Area you may fish for Large Mouth Bass or Catfish. Access to the wildlife area is to the North of the trailhead along County Road 13. This section of the trail has the steepest sections of the trail, but they are still only a gentle climb, and only for a short distance. You will come across an old wooden structure and some old fences that reflect the history of the area. You will also see signage for the B.H. Eaton Ditch. This four-mile ditch was named after a former governor of the State of Colorado that was also a leading figure in irrigation development for Colorado in the 1800s. As you travel this section you will see active gravel pit mining. The gravel is used for roads and concrete. 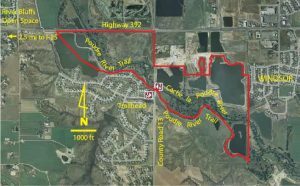 Many of the ponds that you see along the Poudre River are the result of gravel pit mining. Ground water fills in these pits and eventually the grasses, cattails and cottonwoods re-establish themselves in the area. These ponds create an excellent habitat for the local wildlife.